Four major and 24 minor islands make up the Sporades in the Aegean Sea. 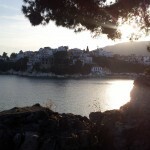 Our base is on the island of Skiathos an emerald in a blue seascape. Skiathos is known for its castles; its rocks damaged King Xerxes’ ship in the Persian Wars. It is a forested island, with many inlets and beaches and is the home habitat of the Mediterranean Monk seal. Although Skiathos is the most popular holiday destination in the area with the most famous beaches, the other three bigger islands of the Sporades Group (Skopelos, Alonissos and Skyros) are equally beautiful and more unspoilt. All of them consist of mountainous terrain, covered with dense vegetation. There are numerous beaches in the area and many of them are only accessible by boat. They are found not only in the bigger and smaller islands, but in the North coast of Evia as well and inside the Pagassitikos Gulf (Volos) and the East coast of Thessaly mainland. Another area to explore is the MARINE PARK of the seal Monachus-Monachus just where the minor islandsof Piperi, Kyra-Panagia, Yioura, Peristera, Psathoura, Skyropoula, and Skantzoura) are situated. Sheltered anchorages and safe waters for beginners and sailors of average experience are the norm. The east coast of Evia is the open to the Aegean Sea; there are just a couple of anchorages that can protect a yacht from the strong northerly winds that prevail in the area. Skiathos, the most cosmopolitan island in the Sporades, is truly a paradise on earth, with lush pine forests and crystal-clear azure waters. Despite the rapid growth in tourism here in recent decades, the island is still picturesque and unspoilt. The most famous is Koukounaries, which has been declared the third most beautiful beach in the Mediterranean. When you add in its bustling nightlife, it is only natural that the island attracts thousands of young visitors every year! Tip. Many clients have a tendency to rush off to the other islands in the Sporades chain without adequately exploring Skiathos – to do so would be to miss out on more than 60 beautifully clean beaches. Whether you want to hide yourself away from the crowds in a secluded bay or dance until you drop – and then wake up and do it all over again, Skiathos, with its delirious night life, is a real treat for our younger clients seeking the freedom to ignore conventions and party to the frenetic beats of their favourite music! The pedestrian street by the Old Harbour should not be missed! Buzzing bars and clubs keep youngsters rocking through the night and until the early morning! The party continues in the area of Ammoudia (on the road to the airport. Skiathos port is a popular yacht and sailing boat haven that adds a cosmopolitan flair to the island. • By ferry or high speed ship from the port of Volos or Ayios Konstantinos. Find out more about our yachts here!